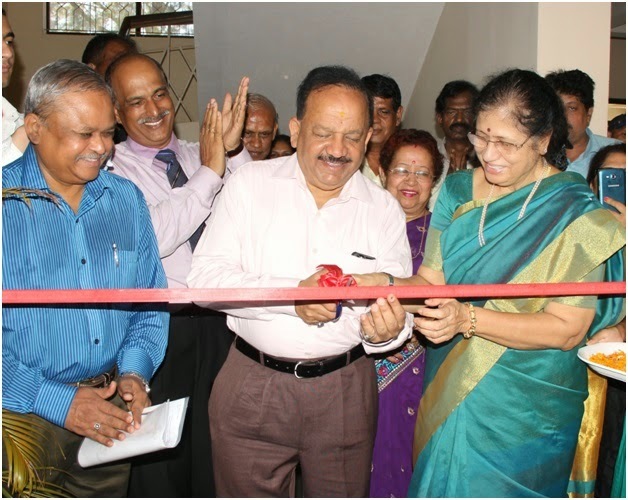 The Union Minister of Science and Technology and Earth Sciences Dr. Harsh Vardhan today inaugurated the Center for Maritime Studies, sponsored by the University Grants Commission, in Port Blair centre of Pondicherry University. In his brief address to the students and the academic fraternity of the campus, he emphasized on the importance of Marine Resources and the importance of Marine Biodiversity for the country. He also visited Department of Ocean Studies and Marine Biology and Department of Disaster Management of Pondicherry University Campus at Port Blair. He impressed upon the students and the research scholars of the campus to take up careers in the arena of Marine Biology studies and also take up research activities for the benefit of our nation. Dr. (Mrs.) Chandra Krishnamurthy Vice Chancellor of Pondicherry University in her welcome speech appraised the Minster about the various Post graduate programs and future developments at the Port Blair Campus. Prof. Jayant Kumar Mishra, Head of the Department of Ocean Studies and Marine Biology listed out the various activities at the Port Blair campus and briefed the Minister on the importance of Andaman Sea from Biodiversity and Bio-resources point of view. The Minister also visited Andaman and Nicobar Centre for Ocean Science and Technology (ANCOST), ESSO-National Institute of Ocean Technology (NIOT), Dollygunj. Dr. N. V. Vinithkumar, Officer-In-Charge, ANCOST-NIOT apprised the minister on various research activities like open sea cage culture of fishes, marine algal biotechnology, marine microbial biotechnology, coastal pollution monitoring, environmental impact assessment studies, bio ethanol production from seaweeds and waste management of trash fishes and island resource information system etc. 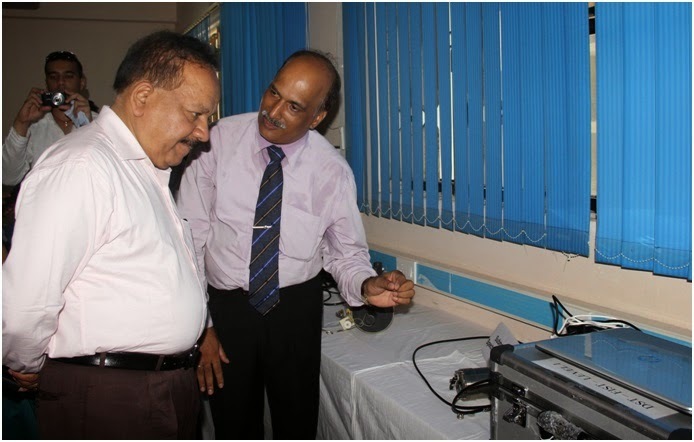 Dr. Harsh Vardhan enquired about the breakthrough made during the past 15 years by National Institute of Ocean Technology in the Andaman and Nicobar Islands. The Officer-In-Charge, ANCOST explained that although various activities were carried out in ANCOST, the open sea cage culture of fishes presently demonstrated in North Bay is for the welfare of island fishers and entrepreneurs. He added ANCOST-NIOT has also developed multiplex PCR kit for the detection of pathogenic bacteria and enrichment medium to attain cell growth within 3 hours period and L- asparaginase from marine actinobacteria is also studied for anti-cancer activities. The Government of India has amended the procedure for appointment of Non Official Directors (NoDs) on the Boards of Public Sector Banks (PSBs), Insurance Companies and Financial Institutions with a view to professionalise the Boards of these banks and further provide required skill sets to improve the quality of deliberations on the Boards of these banks leading to efficient management of these banks and further leading to better profitability ratios. A designated Web Portal ( http://financialservices.gov.in/nod) has been created where interested persons can apply online with all the relevant details. The person will have access to status of his application. • There would be one High Level Search Committee which will go through the available applications and would recommend names to the Government for approval. • Persons of eminence with special academic training or practical experience in the fields of agriculture, rural economy, banking, cooperation, economics, business management, human resources, finance, corporate law, Risk Management, Industry and IT will ordinarily be considered. would be considered. Chartered Accountants with 20 years experience would also be considered. o NoDs could be appointed for maximum six years or two terms. The National Crisis Management Committee (NCMC) again met today under the Chairmanship of the Cabinet Secretary, Shri Ajit Seth and took stock of the situation of Jammu and Kashmir floods. The Committee also reviewed the relief and rehabilitation activities being undertaken by the State authorities as well as the assistance being provided by the Central Government agencies. The state authorities informed that currently the water level is much lower than danger mark while the state machinery is also fully geared up to meet any eventualities. National Disaster Response Force (NDRF) has pressed eight teams to undertake the swift relief and rescue operations in vulnerable places of different parts of the Valley. NDRF teams are in constant touch with the civil authorities for the assessment of situation and to respond as per requirements. Six columns of the Army are also deployed to assist civil authorities. Ministry of Human Resource Development had constituted a Committee of experienced and credible academicians to recommend restructuring and strengthening UGC for attaining even better performance to meet the desired objective. The Committee headed by Dr. Hari Gautam has submitted their report to Secretary (Higher Education). The report is yet to be examined in the Ministry. The news report that UGC is getting scrapped is incorrect and uncalled for. The mandate given to the Committee was to analyse, review and recommend to the Ministry, the architecture required, and the Ministry will have to take a view after going through it threadbare. Hence, no such decision has been taken and the recommendations are yet to be understood and analysed before any decision is taken in the matter. UGC has been created by an Act of the Parliament and cannot be unilaterally scrapped. The Second Round of Tripartite Consultations on Employees Provident Fund and Miscellaneous Provisions Act,1952 (EPF &MP Act) Amendments was held here yesterday. Shri Bandaru Dattatreya, the Minister of State, Labour & Employment (I/C) chaired the second round of tripartite consultations on EPF & MP Act Amendments. The consultations gain greater importance in view of the new amendments proposed in the backdrop of the Union budget proposals impacting the functioning of EPFO. Taking part in the discussions, the representatives of the employers’ associations and federations generally welcomed the various proposals contained in the amendments under consideration. They generally voiced the opinion that the introduction of NPS would mean greater choice for the worker. However, there were also views that NPS cannot match the benefits offered by EPFO and therefore, are not comparable. It was also felt that the amendments would help in sharpening the competitiveness of Indian Industry and would enable India to become a manufacturing hub. However, there was a need to further encourage the concessions granted to the small-scale industries. Increase of coverage also received wide acceptance, both from employers’ and employees’ side. Shri Sharad Patil, EFI (Employers Federation of India), Shri S.S. Patil, AIMA (All India Manufacturers Association), Shri Bhardwaj, Laghu Udhyog Bharati, Shri Sushant Singh, CII (Confederation of Indian Industries), Shri A.K. Padmanabhan, CITU, Shri A.D. Nagpal, HMS, Shri B.L Sachdeva, AITUC, Shri Ashok Singh, INTUC were some of the notable representatives of employers’ associations and employees’ associations (trade unions) who took part in the deliberations in addition to the representatives of various state governments. In exercise of the powers conferred by clause (1) of article 217 of the Constitution of India, the President is pleased to appoint Shri Justice Sunil Kumar Sinha, Judge of the Sikkim High Court, to be the Chief Justice of Sikkim High Court with effect from the date he assumes charge of his office. The Union Minister of State (Independent Charge) of the Ministry of Development of North Eastern Region (DoNER), MoS PMO, Personnel, Public Grievances, Pensions, Atomic Energy and Space, Dr. Jitendra Singh said that Jammu & Kashmir floods are being constantly monitored by latest satellite technology at the National Remote Sensing Centre (NRSC) of ISRO (Indian Space Research Organization) which is also keeping a close watch on the extent of flood damage, by programming its satellites for quick acquisition of data over Kashmir valley region. Disclosing this here today, Dr. Jitendra Singh said that even during the September floods, an ISRO team had been kept permanently stationed at the disposal of the State administration in Srinagar, but somehow it was not utilized to its full potential. This time, however, learning from the past experience, ISRO took upon itself the responsibility of collecting satellite pictures and providing vital information based on these, simultaneously to the union Ministry of Home Affairs, National Disaster Management Authority and the Government of Jammu & Kashmir, he added. Dr. Jitendra Singh said that using microwave satellite data from Indian RISAT-1, the information was sent to all concerned. Further, Canadian Microwave Satellite (Radarsat-2) was also programmed for 31st March 2015 which revealed more inundation in Kashmir valley, particularly in the Anantnag area, he added. This information was also disseminated to all concerned, he said that Indian RISAT-1 satellite has now been programmed for 2nd April, 1800 hrs. From the analysis of the data obtained yesterday evening, Dr. Jitendra Singh said, it is observed that the extent of damage is about 8,134 ha in Baramula, 1,319 ha in Srinagar, 1,292 ha in Badgam, 1,258 ha in Pulwama, 571 ha in Kupwara and 76 ha in Anantnag. This may also include rain water accumulation in low lying areas. Giving all the credit to a high degree of professional excellence and technical advancement achieved by India’s Department of Space and ISRO, Dr Jitendra Singh said, efforts are also going on to acquire more satellite data from other countries under the framework of “International Charter Space and Major Disasters” to facilitate frequent and detailed coverage. The Prime Minister, Shri Narendra Modi dedicated to the nation today, SAIL’s 4.5 million tonnes per annum (mtpa) Rourkela Steel Plant (RSP) modernised and expanded with an investment of Rs 12,000 crore. The event was witnessed by Governor of Odisha Dr. SC Jamir, Odisha Chief Minister Shri Naveen Patnaik, Union Minister of Steel & Mines Shri Narendra Singh Tomar, Union Minister of Tribal Affairs Shri Jual Oram, Union Minister of State (Independent Charge) of Petroleum & Natural Gas Shri Dharmendra Pradhan, Union Minister of State for Steel & Mines Shri Vishnu Deo Sai, Secretary Steel Shri Rakesh Singh and Chairman SAIL Shri CS Verma. During the function, the Prime Minister also awarded the PM’s trophy for the Best Integrated Steel Plant for the years 2010-11, 2011-12 and 2012-13 to Tata Steel Ltd, SAIL Bhilai Steel Plant and JSW Steel Ltd respectively. Before arriving at the inauguration programme, Shri Modi along with other dignitaries witnessed the operation of the new Plate Mill at SAIL, RSP. In his speech, Union Minister of Steel & Mines Shri Narendra Singh Tomar said that it was a matter of pride, privilege and pleasure that the Prime Minister dedicated the 4.5 mtpa steel plant, modernised and expanded with an investment of Rs 12,000 crore, for the benefit of the nation. Shri Tomar added, “Presence of Shri Narendra Modi ji has inspired and enthused the people of Rourkela and has made RSP workforce proud. Under his able leadership, we will be able to steer India ahead in the league of developed nations. By September 2015, SAIL’s production capacity will be enhanced to 23 MTPA, which will be further augmented to 50 MTPA by 2025 under Modiji’s leadership. Besides increasing India’s steel capacity to 300 MT, we are also trying to create a pride of place for Indian steel in the global market. For this, we are laying special emphasis on Research & Development work, and on ensuring availability of raw materials. By bringing in the MMDR Amendment Act 2015, we have brought in greater transparency and ease in the mining sector, which will attract investment, and will transform the standard of living of mines affected peoples and places. Chief Minister Shri Naveen Patnaik expressed gratitude to Hon’ble Prime Minister for choosing the auspicious and historic occasion of ‘Utkala Dibasa’ for marking the dedication ceremony of the steel plant. Describing Rourkela as the first modern city of Odisha, Shri Patnaik said that Rourkela is the pride of the state. He added that Rourkela has played a key role in the development of Odisha, and that its modernization will not only benefit the city, but also the state. In his welcome speech Shri Jual Oram expressed his gratefulness to Shri Modi and other dignitaries for gracing the momentous occasion with their presence. Shri Dharmendra Pradhan specially thanked Hon’ble Prime Minister for his efforts in making Odisha one of the leading states in the country, by driving it to new heights. The modernisation and expansion work at RSP has resulted in capacity augmentation from 2 mtpa of hot metal to 4.5 mtpa. Carried out on a mammoth scale, the modernisation aims to enhance the quality of products, decrease energy consumption and improve environmental performance. RSP has one of the largest Blast Furnaces in the country with a useful volume of 4060 cubic meter. Named ‘Durga’, the Blast Furnace has an annual capacity of 2.8 MTPA. The modernisation and expansion of RSP is part of SAIL’s overall strategy to raise capacity from 13.8 mtpa to 23.46 mtpa. The entire package is being carried out with an investment of Rs 72,134 crore in SAIL’s plants at Bokaro, Bhilai, Durgapur, Burnpur and Salem. The inaugural programme was also attended by Rajya Sabha MP from Odisha Shri Dilip Tirkey, local MLAs Shri Subrat Tarai and Shri Dilip Rai and CEO, RSP Shri GS Prasad. The Water Storage available in 85 important reservoirs of the country as on March 31, 2015 was 53.97 BCM which is 35% of total storage capacity of these reservoirs. This storage is 84% of the storage of corresponding period of last year and 108% of storage of average of last ten years. The present storage position during current year is less than the storage position of last year but is better than the storage of average of last ten years. The northern region includes States of Himachal Pradesh, Punjab and Rajasthan. There are 6 reservoirs in this region having total live storage capacity of 18.01 BCM. The total storage available in these reservoirs is 5.86 BCM which is 33% of total storage capacity of these reservoirs. The storage during corresponding period of last year was 36% and average storage of last ten years during corresponding period was 30% of storage capacity of these reservoirs. Thus, storage during current year is less than the corresponding period of last year but is better than the average storage of last ten years during the corresponding period. The Eastern region includes States of Jharkhand, Odisha, West Bengal and Tripura. There are 15 reservoirs in this region having total storage capacity of 18.83 BCM. The total live storage available in these reservoirs is 9.27 BCM which is 49% of total storage capacity of these reservoirs. The storage during corresponding period of last year was 63% and average storage of last ten years during corresponding period was 40% of storage capacity of these reservoirs. Thus, storage during current year is less than the corresponding period of last year but is better than the average storage of last ten years during the corresponding period. The Western region includes States of Gujarat and Maharashtra. There are 22 reservoirs in this region having total storage capacity of 24.54 BCM. The total storage available in these reservoirs is 9.67 BCM which is 39% of total storage capacity of these reservoirs. The storage during corresponding period of last year was 51% and average storage of last ten years during corresponding period was 43% of storage capacity of these reservoirs. Thus, storage during current year is less than the storage of last year and also less than the average storage of last ten years. The Central region includes States of Uttar Pradesh, Uttarakhand, Madhya Pradesh and Chhattisgarh. There are 12 reservoirs in this region having total storage capacity of 42.30BCM. The total storage available in these reservoirs is 17.79 BCM which is 42% of total storage capacity of these reservoirs. The storage during corresponding period of last year was 50% and average storage of last ten years during corresponding period was 27% of storage capacity of these reservoirs. Thus, storage during current year is less than the storage of last year but better than the average storage of last ten years. The Southern region includes States of Andhra Pradesh, Karnataka, Kerala and Tamil Nadu. There are 30 reservoirs in this region having total storage capacity of 51.37 BCM. The total storage available in these reservoirs is 11.11 BCM which is 22% of total storage capacity of these reservoirs. The storage during corresponding period of last year was 23% and average storage of last ten years during corresponding period was 29% of storage capacity of these reservoirs. Thus, storage during current year is less than the corresponding period of last year and also less than the average storage of last ten years during the corresponding period. Sports Ministry Signs MoU with IIFCL for supporting Badminton sport. Government’s initiative for supporting the Potential Olympic medal winning athletes has received a shot in the arm. The Department of Sports, Ministry of Youth Affairs & Sports (MYAS), Government of India and India Infrastructure Finance Company Limited (IIFCL), a company under Ministry of Finance have signed a Memorandum of Understanding (“MOU”) on 30th March, 2015 for supporting Badminton sport. Under the MOU, IIFCL shall contribute Rs. 30 Crores (Rs. 10 crore each year for 3 years) to the Target Olympic Podium Scheme “ TOP Scheme” under its initiatives for Corporate Social Responsibility (CSR). IIFCL have contributed Rs. 10 Crores to NSDF for the 1st year on 31.3.15. · To ensure that appropriate support whatever required, including but not limited to medical, nutrition and physiological support, is made available to the TOP Scheme Athletes during the Term. Department of Sports is seeking support from companies both in Private and Public sector under their CSR initiatives for sports.